Deal Alert! 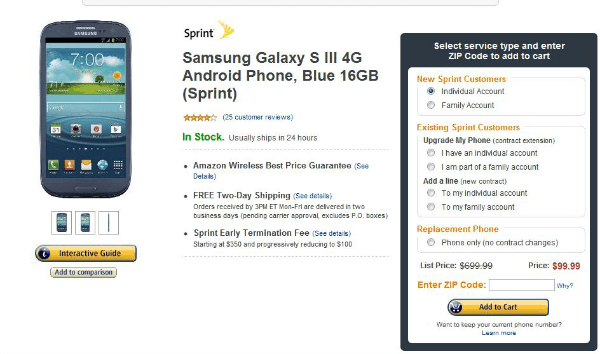 Amazon Selling Galaxy S3 For $99. Limited Time Only! To all of our US readers who badly want a Samsung Galaxy S3, but can’t shell out huge amounts of cash: Today is your lucky day. For a limited time only, Amazon is directly selling the Galaxy S3 for $99 shipped, with your choice of AT&T, Verizon, or Sprint. Now THAT’S what I call a deal. I’m sure that I don’t need to write that much about the Galaxy S3, as you’ve probably heard of it by now. Spec wise, it’s one of (if not THE) most powerful smartphones on the planet. In terms of sales and popularity, it’s even giving the iPhone 4S a run for its money. In terms of...wait....why are you still reading this? You should be heading HERE to pick up this device before the deal ends! You will naturally need sign up for a 2 year contract with one of the 3 available carriers to take advantage of this deal. So if you live in the US and are interested in buying the Android phone that even has Apple shaking in its booties, head over Amazon to get yours today! If you want one on Sprint, click here. If you want one on Verizon, click here. If you want one on AT&T, click here. (AT&T and Verizon offer the deal for both blue and white models, but Sprint seems to only offer it for the blue model). As Samsung has officially confirmed a Jelly Bean update for the Galaxy S3 in October, there's never been a better/cheaper time to buy a Galaxy S3 in the US. Is this Samsung taking a small financial hit to improve the sales numbers over Apple even further. A bit of a slap for being, well, being Apple.